The Kokkalis Foundation and Kokkalis Program organized a two-day program in celebration of ten years of operation in Greece and at Harvard University. The anniversary program concluded with the Kennedy School Forum and closing gala celebration, with keynotes by H.E. Vuk Jeremic, Minister of Foreign Affairs of the Republic of Serbia and Dr. Fareed Zakaria, PBS news series host, editor of Newsweek International and political analyst for ABC News. 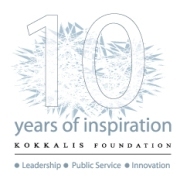 The Kokkalis Foundation was founded in 1997. Its mission is to facilitate peace, international cooperation, and prosperity in Southeastern Europe (DKG’s operations region, as well). Additionally, as the Foundation is situated within the region, it also aims to contribute directly to the development of the public, cultural and scientific life of Southeast Europe through initiatives that affect the social, educational and material well-being of the region. Attendance was strictly by invitation only. DKG executives were participated as AIT executive programmes graduates.